1 How often should I Change my pillow? Pillows were invented to give you a good night’s sleep. Pillows do that by providing support to different parts of your body alongside comfort. On an average, a pillow is in use for about 250,000 hours a year. It is almost equivalent to 100 days. So it is not a surprise that pillows can get worn out quickly. How to test if you need new pillow? A bad pillow obstructs a good night’s sleep. Its considered bad if it is the wrong pillow for your sleeping position or because the pillow is worn out. A worn out or “tired” pillow will not perform efficiently. The worn out pillows will not even provide the intended support. This might be a problem for patients who use pillows to counter act their problems.It has been seen in studies. Synthetic pillows last between 6 months up to 2 years. But some high quality down pillows can last for 10 years or more. Symptomatic people who use synthetic pillow, may need to replace them annually. The pillow will be usable for many years for casual purposes. But the pillow will have lost most of its original properties. This will not help symptoms of the patient. For regular sized pillows, fold the pillow in the middle on a sturdy and flat surface(for large pillows, fold it into thirds). Squeeze all the air out of the pillow. If the pillow bounces back to its original shape after releasing, then the pillow is alright and still usable. But sometimes the pillow will remain folded. This might happen because of two reasons. The pillow has lost its original properties due to long use. Or the pillow is damp from your night’s sleep. So, make sure the pillow is aired out thoroughly before testing. With proper care, feather and down pillows last for many years. Put your pillow on a flat surface. Then fold it in half(fold it in thirds for larger pillows), squeeze out all the air. And hen put a shoe on it. A heavy shoe is recommended. The pillow is supposed to toss the shoe as it bounces back to its original shape. If it fails to do so, then it has lost its properties. Then you should consider buying a new pillow. Fiber pillows usually have a lifespan between 6 moths and two years. Testing these pillows is a bit more difficult. You need to change these pillows when they cannot resist to deformation. When they flat out too easily. In case of memory foam pillows, put pressure on them with your hands. If it returns to its original shape within a couple of minutes, it is alright. If it does not, you need to change the pillow. For conventional foam pillows the reaction should be instantaneous. Foam pillows usually last between 6 months and two years. There are also other indicators which tell you that you need a pillow replacement. Your pillow does not feel or look like the way it used to when you bought it. Pillow is out of shape or lumpy. Pillow has become visibly dirty or stained. You feel uncomfortable when lying on it. Your neck, back, ankles or knees are really sore or stiff after a night’s sleep. Now the question may arise why do we need to replace our worn out pillows. There are many logical reasons behind it. Neck problems: When you lie down, your pillow should fill the gap between your shoulders and head. If you use a pillow for too long, it will surely flatten it out. This pillow will not be able to support your head or neck. This will result in pain and stiffness. Dust mites:These are microscopic bugs. These bugs grow by eating dead skin cells. They reproduce in humid and warm environment just like your pillow. They don’t bite or spread diseases. But they promote allergies. Prolonged exposure to dust mites can develop asthma. Down pillows are most prone to dust mites. Any pillow can become sanctuary for dust mites after about a year of use. After a year 10 to 15 percent of the total weight might be from dust mite waste.If your allergies are triggered after every night, it could be due dust mites. You should wash your pillow in hot water every week. This will kill dust mites. You can also try freezing your pillow overnight. You should treat the whole pillow, not just the pillow case. You can also cover your pillow with dust proof cases. Wool pillows resist dust mites naturally. They are also fire resistant. Fungal spores: Your pillow might contain millions of fungal spores. Fungal spores like Aspergillus fumigatus can cause Aspergillosis. This is an infection. It begins in your lungs. Then it spreads to other parts like brain.It has been shown in a study that, a pillow used for 1.5 years to 20 years are most likely to have millions of fungal spores. There are about 16 different fungus, which were found in the pillows.Synthetic materials tend to house more fungus. Whereas natural wool is fungus resistant. Flame retardant chemicals: Flame retardant chemicals are applied to some pillows. Polybrominated diphenyl ethers (PBDEs) is a bromine based flame retardant chemical. This chemical has been linked to cancer. This chemical has been proven to cause harm to pregnant women and the fetus. It decreases fertility upon prolonged exposure. So from the above discussion it is evident that you need to change your pillow every once in a while to avoid risks of allergies and lack of support. 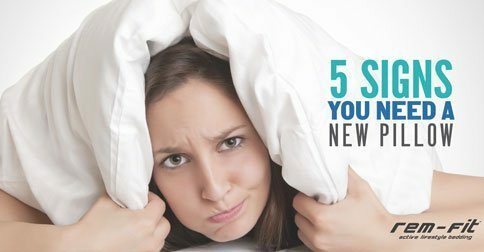 The following ways can help you determine whether you need a new pillow or not. Fold test: do the fold test on your pillows. If the pillow fails the test, change it. Lumps and bumps: If there are lumps and bumps in your pillow, then your pillow material is starting to decay. This means, the pillow is no more comfortable. You are not getting the desired support. You should change it. Take off the pillow case: Take the case off and look at your pillow. If there are sweat stains or if you are repulsed by the color, it’s time to buy a new pillow. Check the tag: Some pillows come with an expiry date. So make sure to check the tag of the pillow if it has one. The type: Different pillows have different life span. Shredded memory foam pillows have a long life span than any other. Some come with 20 year warranty. Polyester pillows have life span starting from 6 months to 2 years. Memory foam pillows on the other hand have life span from 5 to 7 years. Latex pillows are completely washable. They can last up to 10 years. In some cases, they don’t even need replacing. Try to change your pillows regularly. Dead skin cells deposit over your pillow if used for a long period of time. Body oils also build up. These may give birth to bacteria. Moreover, if you don’t wash your pillow regularly, it will lose its freshness. This will obstruct a good night’s sleep. If you are not in favor of changing your pillow regularly, try investing in a product which has a long life span and is anti-bacterial and hypoallergenic. Memory foam pillow is highly recommended. They are bit expensive than traditional pillows. But the benefits are worth it.